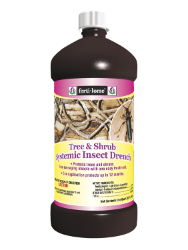 Use on Outdoor Trees & Shrubs Controls Adelgids, Leaf Beetles (including Elm Leaf Beetles and Viburnum Leaf Beetles), Vine Weevils Larvae (including Black Vine Weevils), Leafhoppers (including Glassy-Winged Sharpshooter), Roundheaded Borers (including Asian Longhorned Beetle and Eucalyptus Longhorned Borer), Flatheaded (including Bronze Birch Alder, and Emerald Ash Borers), Leafminers, Mealybugs, Pine Tip Moth larvae, Japanese Beetles, Adult, Psyllids, Lacebugs Royal Palm Bugs, Sawfly Larvae, Scales (includes Armored Scale [Suppression] and Soft Scale, Thrips, and Whiteflies. Shrubs: 3 ozs. Per foot of height per gallon of water.